I am proud to say that I suffer from zero food related allergies. Now, I’m not saying this makes me better than those who cannot tolerate the likes of dairy, gluten, or tree nuts, but I do know these things taste awesome and I thank my lucky stars they cause me no side affects. One of my current obsessions is peanut satay sauce. We all know the dreaded peanut can cause anaphylaxis and death, sometimes by minor cross contamination or scent alone. This is a severe allergy, so if you and the peanut have had your differences, get off this page immediately. 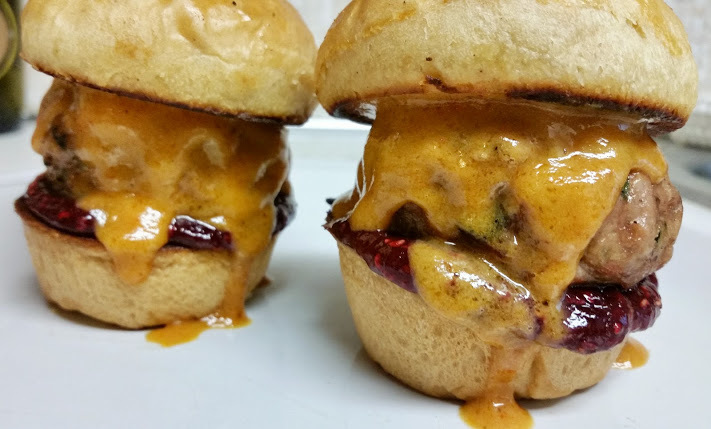 I am about to break down my savory pb&j turkey burger sliders, and they are drowned in fabulous Thai style peanut satay sauce. I will accept no responsibility for when you read this recipe, look at the pictures, start drooling and decide your allergy is not actually that serious. I would say these sliders aren’t worth dying for, but honestly, they kind of are. Let’s start this adventure with the phenomenal peanut satay. It is primarily made from freshly ground peanuts, coconut milk, sugar and Thai red curry paste. Basically it is on the sweeter end of the spectrum, but the red curry paste lends a touch of complexity that hits your taste buds in an exceptionally positive way. I followed Leela Punyaratabandhu’s recipe from her blog SheSimmers. You can find it here. Upon first taste, I could not help but think of what an incredible substitution it would be in a peanut butter and jelly sandwich. I continued to ponder because using something like Smucker’s Concord Grape would be a silly insult. It needed to be paired with something that had a bit of a bite, an edge and maybe just a little attitude. So I decided on raspberry jam with just a touch of chipotle. You have your bitter, your sweet, your smokey and your spicey. This is getting good. A little too good. Why stop at a basic sandwich? Why not throw a slab of meat in the middle? 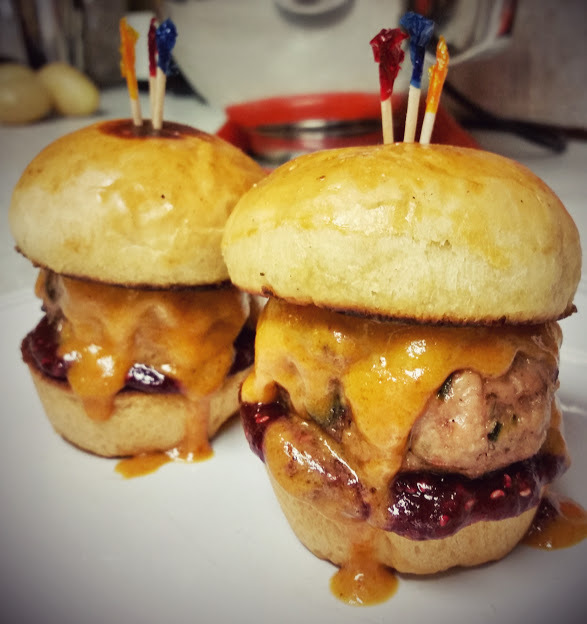 Peanut satay pairs specifically well with poultry, so a turkey burger just made sense, but why stop with just ground turkey? Why not add turkey bacon as well? It was decided. Crunchy, delightful turkey bacon bits would be mixed directly into the patty. We have a DOUBLE turkey burger on our hands. 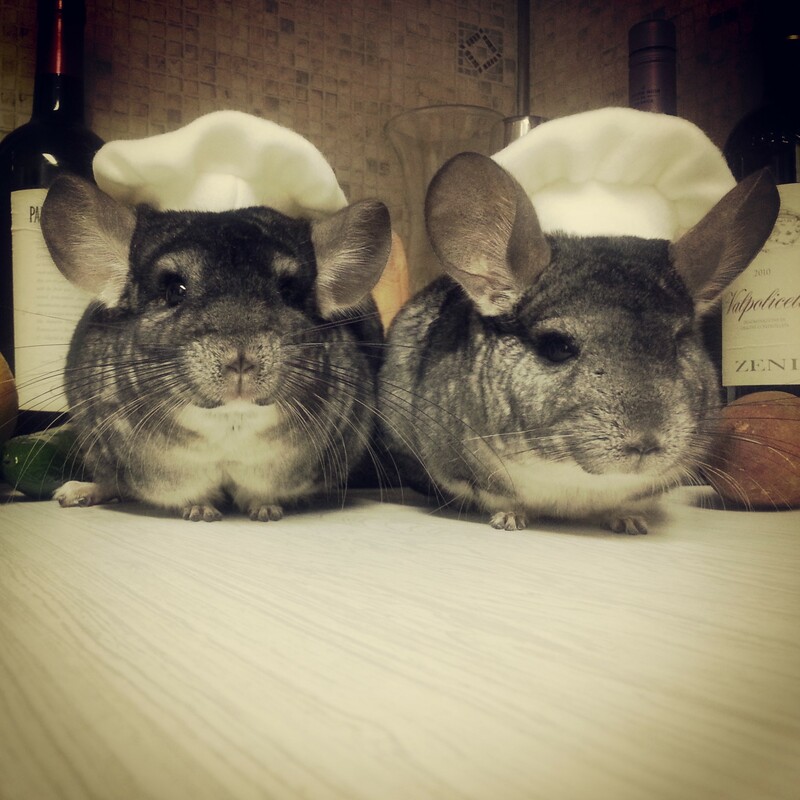 Next thought: cheese. WHY NOT?! How about monterey jack? It is semi-hard, but it melts beautifully and its mild, creamy demeanor subtly enhances the other headlining flavors. Final consideration: the bun. This was a crucial decision, but I went with my gut, which was obviously screaming Portuguese sweet bread. At this point we were going full on savory, so I figured the best call would be to miniaturize the situation. Sliders. A few bites are definitely enough to satiate, but for those who cannot get enough, it is just as easy to crush two or three (equaling a full-size burger). It is time to break this all down. You should make the peanut satay (see link above) and jam at least a few hours in advance so they have time to solidify. The jam is idiot proof. Put all the ingredients in a sauce pan and let it simmer for 15-20 minutes. Give it a taste. If you can barely taste the chipotle, puree the whole pepper with the raspberries. If you are already finding it too hot to handle, pull the whole pepper out or take half of it out and puree the rest. As per usual, DO IT TO YOUR OWN TASTE PREFERENCE. In any of the above cases, you should use an immersion blender and get all contents moderately smooth (a little extra texture is OK). Let it cook another 10 minutes or so, until it is fairly reduced. Then let it cool on the counter. Finally place it in the fridge for at least an hour. It should set up fairly well, no cornstarch necessary. 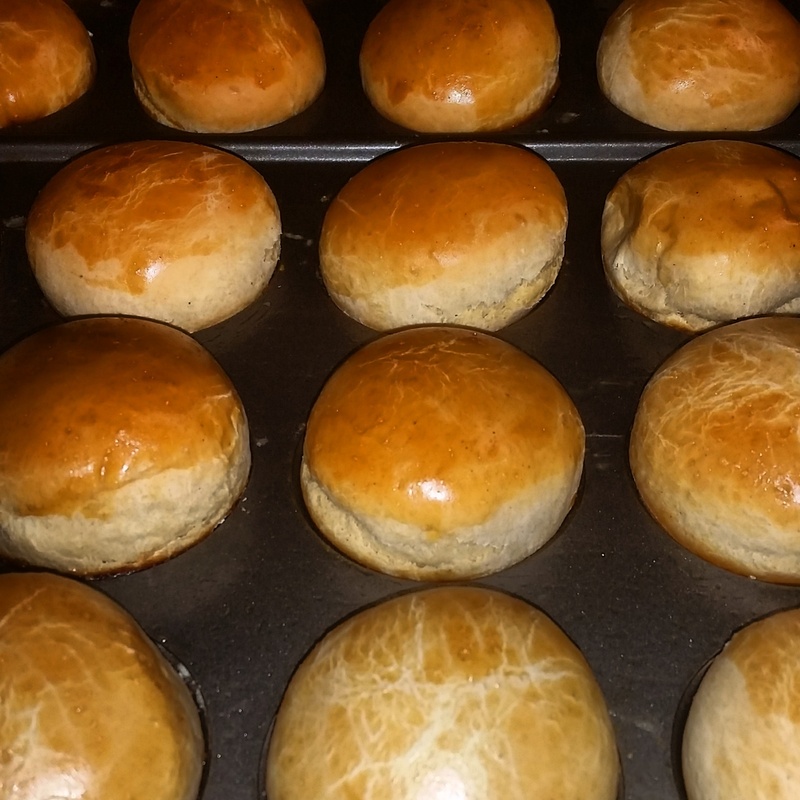 Now, I should mention that I did make my own sweet bread rolls. If you live in southeastern New England, you can find this bread almost anywhere and you can easily cut down the standard larger loafs to slider size buns. If you do not live in an area with a predominant Portuguese population or if you just love to bake, you can make your own bread in muffin tins (which produce the perfect adorable size). I would suggest this recipe. I followed it fairly closely with a few minor exceptions, but feel free to research and find something better. I won’t be offended, hell, let me know if you produce something fantastic! They did come out looking pretty legit. 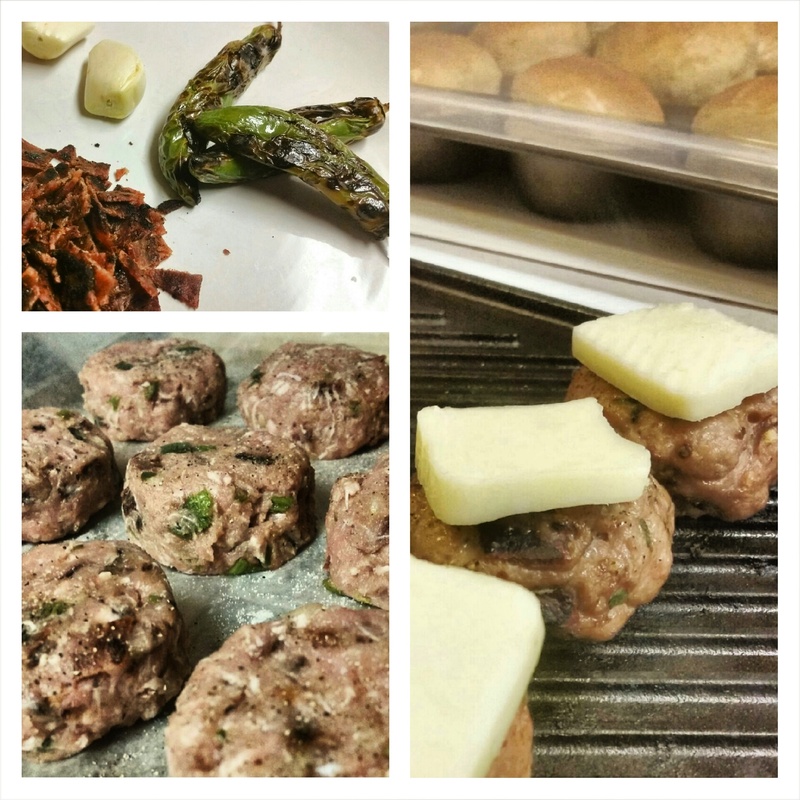 The burger prep is easy and fun. First, char the jalapeños on the grill, which means get them to a point where the skin has dark marks and blistering. The charring creates a whole new and totally obligatory dimension of flavor. Once charred, slice them open and remove most of the seeds and ribs. I say most because I like to leave some of that jazz so there is still a bit of heat. At this point you can dice up the peppers and set them aside. Next, bake or fry all the turkey bacon until it is perfectly crispy, then chop it into “bits”and set it all aside. It is time to grab an egg, strain the yolk and put just the white in a large mixing bowl. Add the jalapeños, bacon and grated garlic cloves to the bowl. Finally add several shakes of s & p and the Goya Adobo Hot Seasoning. Whisk everything together and then start folding the ground turkey into the mix. Use your hands and really get after it. Once everything is fairly copacetic and blended, I like to add a tablespoon or two or breadcrumbs. A panko or other light breadcrumb is ideal. This helps further bind the patty and doesn’t really effect the overall flavor. Once again, work the crumbs in so they are evenly distributed throughout the mixture. To make the patties, I filled a 1/4 cup individual measuring cup. This made nine thick patties. You could of course make them smaller, but I liked these chunky guys. I then baked them for 20 minutes at 350 to ensure they will be cooked through, but you should still finish them on the grill. Just a couple minutes on one side, then flip and top with cheese. When they start to look ohh soo ooey gooey, pull them. I like to butter and either grill or toast the bread griddle style. 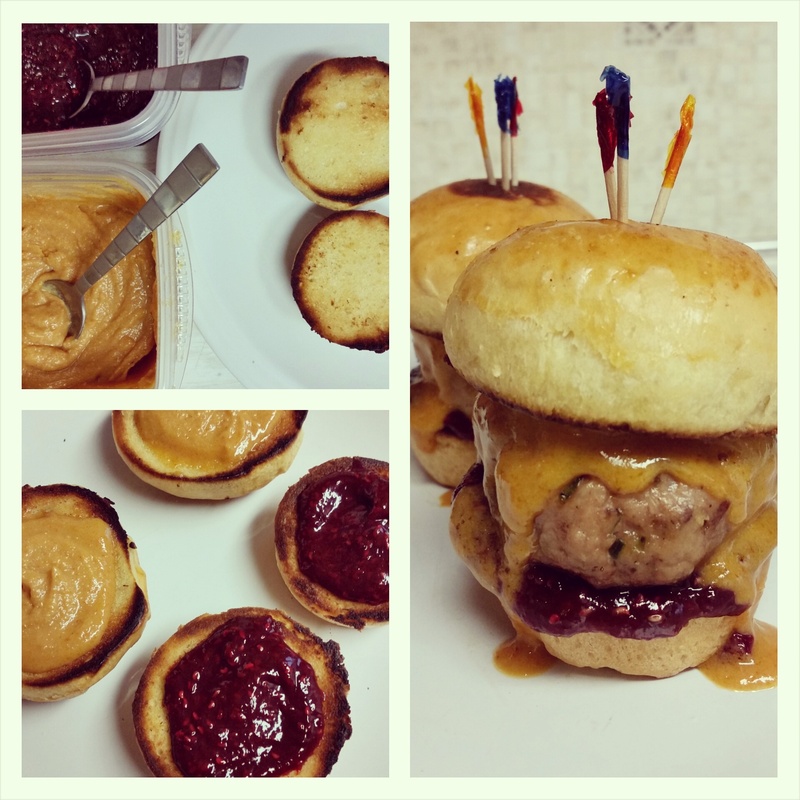 Slather the jam on the bottom bun and the peanut satay on the top. Stack it all up and call it a day. A DELICIOUS DAY. Thanks! Besides the bread, they’re pretty easy to make. Highly recommend getting after it.